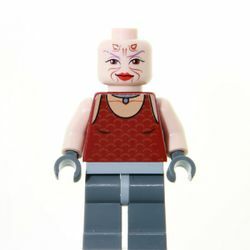 Sugi is a Minifigure released as a part of the Star Wars: The Clone Wars theme She is currently exclusive to one set, 7930 Bounty Hunter Assault Gunship. Sugi is colored light nougat. Her torso and head are exclusive to her. Her head is light nougat, like the rest of her body, and has brown eyes, with purple eyebrows above. As a Zabrak, she has horns printed at the top of her head such as the last version of Darth Maul or Savage Opress. However, the horns are not a head piece and are not very noticeable. Underneath her eyes are faint wrinkles around her confident smile. The back of her head also has a printing, resembling a purple ponytail with horns on the left and right of it. Her torso printing depicts a dark red vest along with a silver necklace by her neck. The back printing of the torso depicts the same dark red vest, except facing the other way. Her arms are light nougat, but she has dark stone grey hands. Her leg connector piece is light stone grey, while her legs are dark stone grey, with no printing. She carries a blaster pistol and her "trusty Vibroblade". Sugi is a female Zabrak who worked as a Bounty Hunter and mercenary during the Clone Wars. She commonly carried an EE-3 carbine rifle and her trusty vibroblade. She was an experienced Bounty Hunter, and successfully helped Obi-Wan Kenobi, Anakin Skywalker and Ahsoka Tano defend a village from pirate attacks. Early preliminary images of the Bounty Hunter Gunship listed a minifigure as "Sugii", but the figure resembled Cato Parasitti.